Clever Words. Pretty Delicious Things. 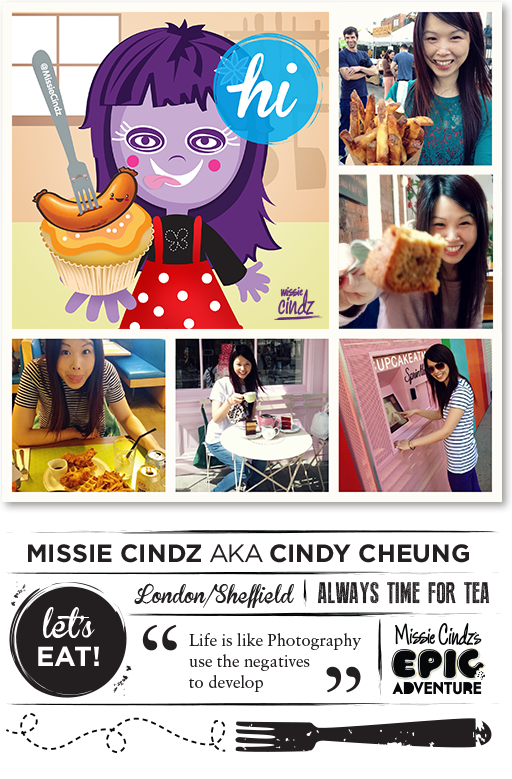 Missie Cindz – The Food Enthusiast (is the alter-ego to full-time London based, Graphic Designer, Cindy Cheung), was set up and ran in Cindy’s own time at the end of 2010. A personal creative project inspired by Cindy’s earliest food memories from her parents’ food business as a kid. This blog has evolved into a platform for sharing exciting local food discoveries (especially in London and Sheffield), fun gatherings & events, championing independents and a place where collaborations and creative ideas can manifest through. Our writings can be from anywhere and everywhere. If you want to get in touch about anything on this blog please email Cindy. PLEASE NOTE: We do not offer text links nor do we accept payment for the things Cindy writes about. All posts are about things we love and want to share with readers. The integrity of what is written is extremely important – all thoughts and opinions are solely ours (unless stated otherwise).